Note to self during reading: Why did I start reading this book? My goodness, this book is powerful. Okay, first up, this book made me cry. It goes in the rare amazing category of "this book is amazing and/or life-changing, let me buy you a copy" books. I started this book today, and finished this book today. I wanted something slightly different than the yet-another-astrophysics book I was reading, and picked this one up. And didn't put it down. And I cried. So much of this book is about the unfairness of life, how the good are cut down too soon, how life takes unexpected turns, how much of life is loss, how we all struggle, and how beautiful a life can be when it has a passion, has meaning. I don't know. In some ways, it was yet another reminder of how much of my life I have done wrong. That makes it a good book, I'd say, a book that causes self-reflection. 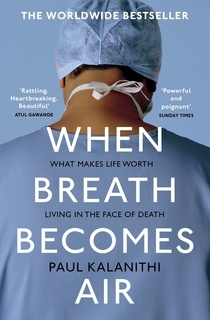 As Kalanithi asks, "If the unexamined life was not worth living, was the unlived life worth examining?" I'm not spoiling anything by saying, hey, he dies in the end. We all die in the end. Not all of us go out gracefully, or so soon. Not all of us live as well or as intensely. I will be rereading this book. It's amazing, let me buy you a copy. I spent the next year in classrooms in the English countryside, where I found myself increasingly often arguing that direct experience of life-and-death questions was essential to generating substantial moral opinions about them. Words began to feel as weightless as the breath that carried them. Moral speculation was puny compared to moral action. The neatness of medical diagrams did nothing to represent Nature, red not only in tooth and claw but in birth as well. I still had a lot of practical medicine to learn, but would knowledge alone be enough, with life and death hanging in the balance? Surely intelligence wasn’t enough; moral clarity was needed as well. Somehow, I had to believe, I would gain not only knowledge but wisdom, too. By the end of the conversation, the family was not at ease, but they seemed able to face the future. I had watched the parents’ faces—at first wan, dull, almost otherworldly—sharpen and focus. At those critical junctures, the question is not simply whether to live or die but what kind of life is worth living. Because the brain mediates our experience of the world, any neurosurgical problem forces a patient and family, ideally with a doctor as a guide, to answer this question: What makes life meaningful enough to go on living? Drowning, even in blood, one adapts, learns to float, to swim, even to enjoy life, bonding with the nurses, doctors, and others who are clinging to the same raft, caught in the same tide. When there’s no place for the scalpel, words are the surgeon’s only tool. I had to help those families understand that the person they knew—the full, vital independent human—now lived only in the past and that I needed their input to understand what sort of future he or she would want: an easy death or to be strung between bags of fluids going in, others coming out, to persist despite being unable to struggle. To me, that hardness always seems brittle, unrealistic optimism the only alternative to crushing despair. Those burdens are what make medicine holy and wholly impossible: in taking up another’s cross, one must sometimes get crushed by the weight. While most scientists connived to publish in the most prestigious journals and get their names out there, V maintained that our only obligation was to be authentic to the scientific story and to tell it uncompromisingly. Doctors in highly charged fields met patients at inflected moments, the most authentic moments, where life and identity were under threat; their duty included learning what made that particular patient’s life worth living, and planning to save those things if possible—or to allow the peace of death if not. Death comes for all of us. For us, for our patients: it is our fate as living, breathing, metabolizing organisms. It felt less like an epiphany—a piercing burst of light, illuminating What Really Matters—and more like someone had just firebombed the path forward. Now I would have to work around it. Yes, all cancer patients are unlucky, but there’s cancer, and then there’s CANCER, and you have to be really unlucky to have the latter. What patients seek is not scientific knowledge that doctors hide but existential authenticity each person must find on her own. Getting too deeply into statistics is like trying to quench a thirst with salty water. The angst of facing mortality has no remedy in probability. If the weight of mortality does not grow lighter, does it at least get more familiar? After so many years of living with death, I’d come to understand that the easiest death wasn’t necessarily the best. The monolithic uncertainty of my future was deadening; everywhere I turned, the shadow of death obscured the meaning of any action. Why? Because I could. Because that’s who I was. Because I would have to learn to live in a different way, seeing death as an imposing itinerant visitor but knowing that even if I’m dying, until I actually die, I am still living. She had done what I had challenged myself to do as a doctor years earlier: accepted mortal responsibility for my soul and returned me to a point where I could return to myself. Not only that, but maybe the basic message of original sin isn’t “Feel guilty all the time.” Maybe it is more along these lines: “We all have a notion of what it means to be good, and we can’t live up to it all the time.” Maybe that’s what the message of the New Testament is, after all. Even if you have a notion as well defined as Leviticus, you can’t live that way. It’s not just impossible, it’s insane. There we were, doctor and patient, in a relationship that sometimes carries a magisterial air and other times, like now, was no more, and no less, than two people huddled together, as one faces the abyss. Most ambitions are either achieved or abandoned; either way, they belong to the past. The future, instead of the ladder toward the goals of life, flattens out into a perpetual present. Paul’s decision not to avert his eyes from death epitomizes a fortitude we don’t celebrate enough in our death-avoidant culture.